The normal cornea (the front clear lens of the eye, similar to the crystal on a watch) supplies about 75% of the eye's focusing power. In keratoconus, the cornea becomes thinner and loses its structural integrity. As a result, it loses its uniform, domelike configuration and develops irregular astigmatism and other optical irregularities. Therefore, it is unable to produce a clear image inside the eye. In the earliest stages of keratoconus, patients are often able to see adequately with spectacles or traditional soft contact lenses. As the condition worsens, the shape of the cornea becomes more ireegular. In most cases, glasses and traditional soft contact lenses no longer provide satisfactory vision. Because the optical surface of the cornea is irregular in keratoconus, glasses cannot give crisp focused vision. Contact lenses, in particular specially fit rigid gas permeable contacts (RGP) and a variety of specialty KC and therapeutic contact lenses, can cover these irregularities and better focus incoming light. 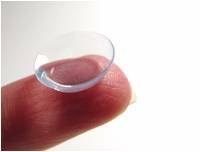 Applying a rigid lens allows tears to fill the space between the contact lens and the cornea. This layer of fluid optically neutralizes the irregularities of the cornea such that, for all practical purposes, the cornea itself ceases to have any optical effect. The front surface of the contact lens now effectively becomes a new corneal surface... but a surface that we can control, being perfectly smooth, clear, and regular, and also containing the patient's prescription. The contact lens produces a clear image in the eye, often with a dramatic visual improvement for the keratoconus patient. Adapting lenses of this type is challenging and rewarding for both doctor and patient. These highly specialized lenses feature a complex series of curves to enable us to fit the lens such that patients may enjoy vast improvements in vision and be able to utilize the lenses throughout their active day. These lenses range from the very tiny (6 mm) to quite large (14 mm). Here at The CLEI Center for Keratoconus, we are able to offer patients a variety of keratoconic lenses in order to fit all of the varied shapes and requirements of the keratoconic cornea. We have every modern technology available for the diagnosis and treatment of this disease and a vast specialized KC contact lens inventory (including our own Hersh Palpebral Traction Lens). This gives us the tools to meet the challenge of the keratoconic cornea and restore the patient to useful vision. Led by Dr. John Gelles, the contact lens division of the CLEI Center for Keratoconus strives to achieve success with even the most difficult KC challenges. Though not always successful, we will spare no effort in assuring that you get the best result possible.